Journalists are starting to get their hands on the new Panasonic GX1 CSC camera, and it's a beauty. I like the gunmetal grey version myself. PhotographyBlog writes: "...the 16 megapixel Panasonic GX1 offers an ISO range of 100-12800, auto-focus speed of 0.09 seconds, full HD 1080i video recording, a 3-inch screen with 460k dots, built-in pop-up flash, and 4.2 fps burst mode at full resolution. Available in Gunmetal Grey and Raven Black, the GX1 will be available from mid December priced at Â£499.99 body only, Â£599.99 with the standard 14-42mm kit lens, and Â£729.99 with the 14-42mm power-zoom lens (from mi January 2012). 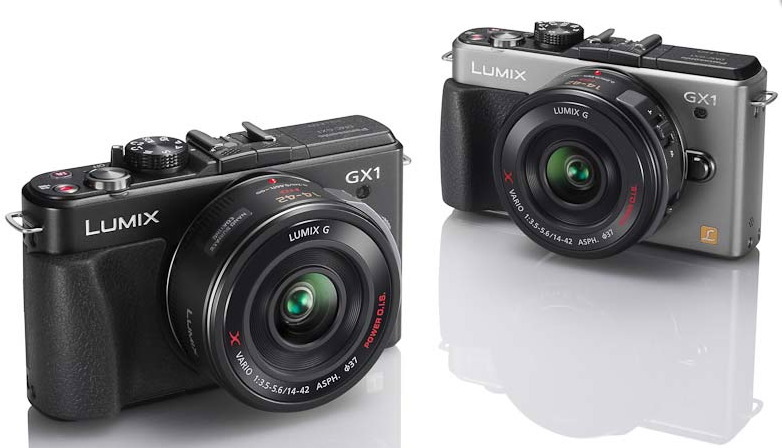 The GX1 is a member of the micro four-thirds family and shares lens mount compatibility with the Olympus PENs. With Panasonic's 14 lens lineup, including the cool pancake lens sized 14-42mm X zoom lens, plus the solid Olympus lens family, I think this is the most versatile tandem in the Compact Systems Camera world. If anyone out there scores a GX1, please send me your impressions. I recently came across one of my favorite photos of Steve Jobs. 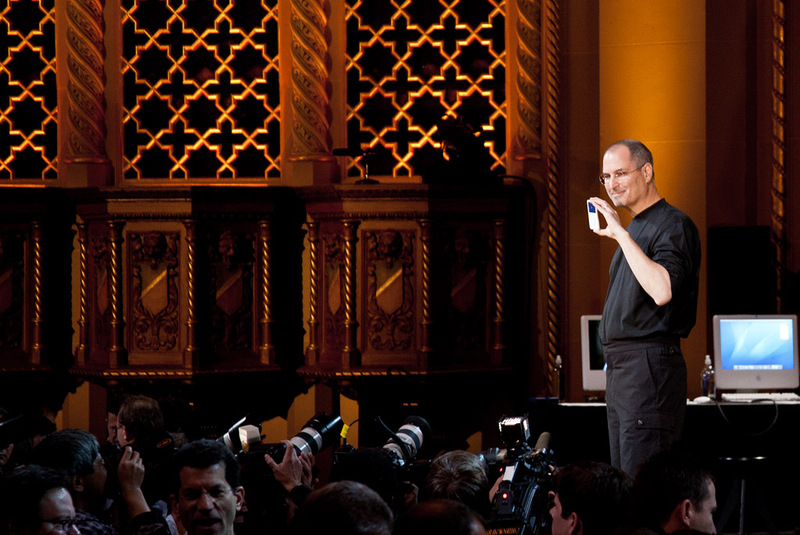 I took this shot in Oct. 2005 during the Apple event at the California Theater in San Jose, CA where Steve introduced the Video iPod. Steve Jobs proudly displaying the new Video iPod on Oct. 2005. Photo by Derrick Story. Click on image to enlarge. What I like about this image, is the healthy looking Steve Jobs proudly holding up the new Video iPod that played movies as well as music on a 320x240, 2.5" TFT color screen with 260,000 colors. The 30 GB model was available for $299, while the 60 GB version sold for $399. I still have my 30 GB model, serving me well to this day as the music player for my Audi. A new version of iTunes was also unveiled, allowing users to buy music videos, TV shows, and even movies. In all the years of my following the work of Steve Jobs, I remember this day as being one of the happiest. He looked so proud and confident. And he had complete control of a packed house of journalists. It was really something to experience. The Nov. 2011 assignment is "Black & White." Start working on your contribution now. Details can be found on the Member Participation page. Deadline is Nov. 30, 2011. Please follow the instructions carefully for labeling the subject line of the email for your submission. It's easy to lose these in the pile of mail if not labeled correctly. 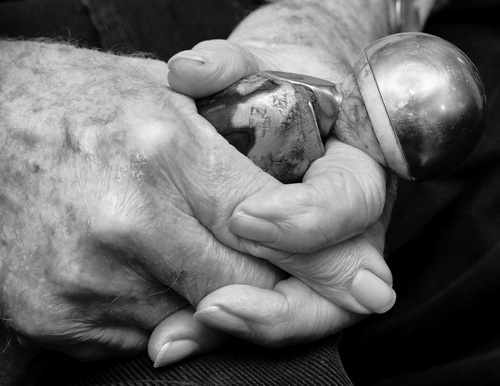 For example, the subject line for this month's assignment should be: "Photo Assignment: Nov. 2011." Also, if you can, please don't strip out the metadata. And feel free to add any IPTC data you wish (These fields in particular: Caption, Credit, Copyright, Byline), I use that for the caption info. Good luck with your Nov. assignment, and congratulations to all of the fine contributors for September. Of the interviews I've done, this chat with Leo Laporte on TWiT Photo goes down as one of my favorites. At Leo's studio in Petaluma, CA - fondly referred to as the Brick House - we discussed photography technique, gear, current technology, and how to become a better shooter. Frequent TWiT viewers know how gracious and intelligent Leo is, and he's in full stride during this episode. I think you'll really enjoy the show. You can also download the free episode in iTunes and listen at your convenience. Or, if you prefer the video version (more better! ), then watch here or download the show. 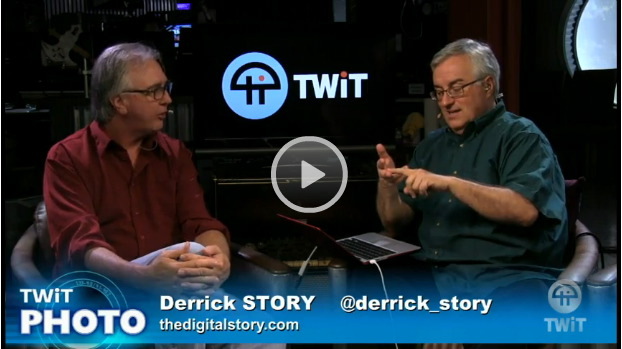 Thanks to Leo and the entire TWiT gang for having me on the show. A big challenge for photographers these days is distinguishing themselves from others. A pretty landscape image just isn't going to do it. I have five suggestions to help you become more notorious. Not so much being bad, but maybe a bit different. If you're going to pull this off, you're going to need some tools. After all, the Sundance Kid was a good shot too. 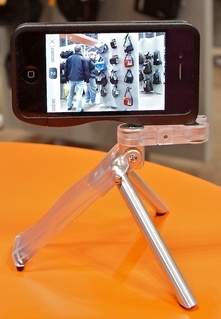 I just spent a week on the road with the Gymbl case and tripod for my iPhone 4S. It's a clever combination of a hard case that protects the iPhone, and includes a low-profile mount to attach the tripod/stand in a jiffy. The two pieces work together great, and they add little bulk or weight to you pockets. The case itself is rigid plastic that covers the back and edges of the iPhone. There are beveled openings for the camera lens, flash, lock slider, volume buttons, earphone jack, power button, dock connector and speakers. You shouldn't have to remove the phone from the case unless you have a special need for it to be unencumbered. The Gymble tripod/stand is Swiss Army knife in design. At first it looks very simple. But then you realize that it includes a regular tripod socket (for a standard set of sticks), and its own mount that provides for a wild variety of positions. Be sure to take a look at the Gymbl site to see all the possibilities. You might miss one otherwise. I used it as a tripod to record this time lapse movie at PhotoPlus Expo. But I found other uses for the Gymbl too. When taking a coffee break, for example, I could position my iPhone at a comfortable viewing angle to read the daily news or check email. It also works as a secure grip for recording handheld video. 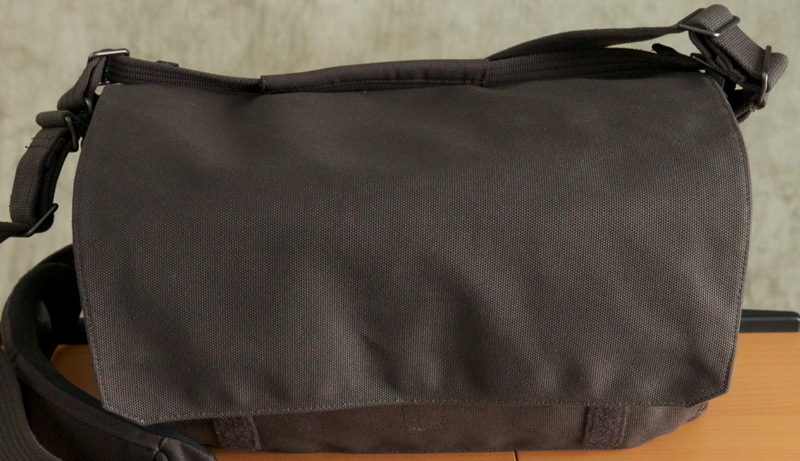 The Gymbl costs about $69, and that includes both the durable case and clever tripod/stand. The metal and high tech plastic components are nicely machined and well-designed. The tripod itself is very light and easily slips in any pocket. (rating would climb to "4" if the price were $20 less). You could call it: "time lapse photography made easy." 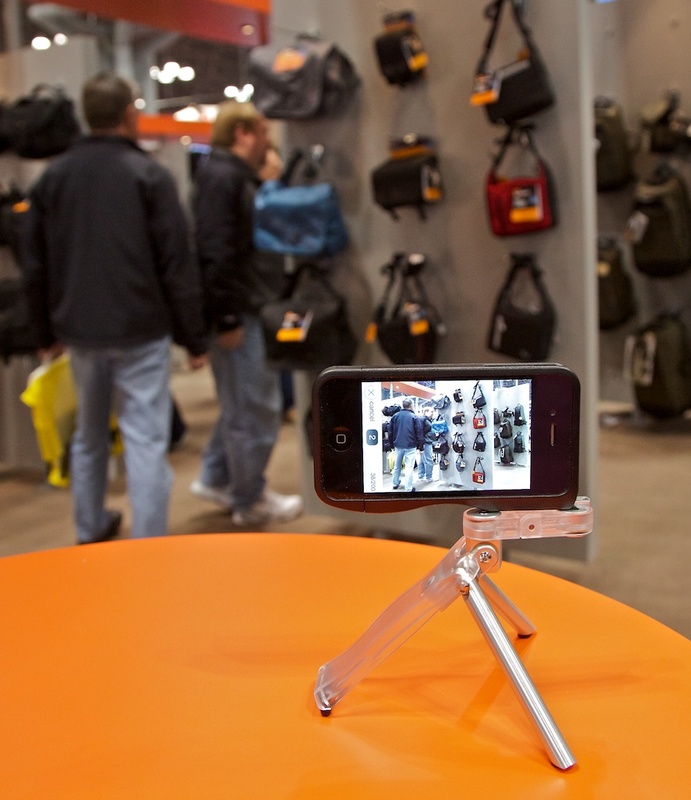 I mounted an iPhone 4S on a Gymbl tripod and launched the Joby Gorillacam app to make this 1-minute recording of Friday morning at PhotoPlus Expo just as the doors were opening. The video consists of 328 frames played at 6 frames per second. I used the Pro version of QuickTime Player 7 to take the individual frames from the iPhone and make the movie. The images were automatically sent to my Mac using Photo Stream. 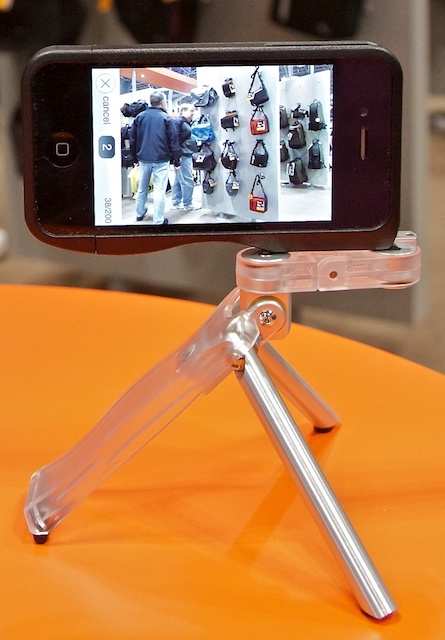 iPhone 4S mounted on a portable Gymbl tripod. While still in QuickTime 7, I added a royalty free music soundtrack as the finishing touch. I think the boogie beat goes great with the time lapse images. I saw this served across from me at Trattoria Dell'Arte, 900 7th Ave (between 56th and 57th st) in New York City. I think it qualifies for a Man vs Food episode. In case you've never seen this dish before, it's Veal Parmigiana. And no, he did not finish the meal. So in this case, food won! I'm heading out for Day Two of PhotoPlus Expo. If you're in town, come by and see me. I should be around the Lowepro booth most of the day. My class on Revenue Streams is Saturday morning also.